TOP-PHOS is a brand new form of Phosphorus fertiliser which is available NOW. It is a revolutionary new Phosphorus technology that has been developed by Groupe Roullier. It is available in Ireland from Grassland AGRO. TOP-PHOS is a new and unique chemical form of phosphorus compared to standard P fertilisers. It has been recognised within the EU REACH regulations as being different to the traditional forms of P used in standard fertilisers. TOP-PHOS is a new fertiliser ingredient called Complex Super Phosphate (CSP). It is a water soluble phosphorus fertiliser, and is therefore available quickly for uptake by the grass. However, unlike standard forms of phosphorus, the chemical make-up of TOP-PHOS protects it from being locked up by the soil. This maximises the availability of P to the grass. It also contains stimulants that are designed to increase root mass to improve P efficiency and to increase soil microbial activity to release P from the soil reserves. So How Does TOP-PHOS Help Spring Grass? Phosphorus availability in soils is always challenging, particularly in the cooler soil temperatures in spring. TOP-PHOS increases the availability of P and will therefore increase spring grass growth, as more of the P applied can get to the grass faster to kickstart growth. 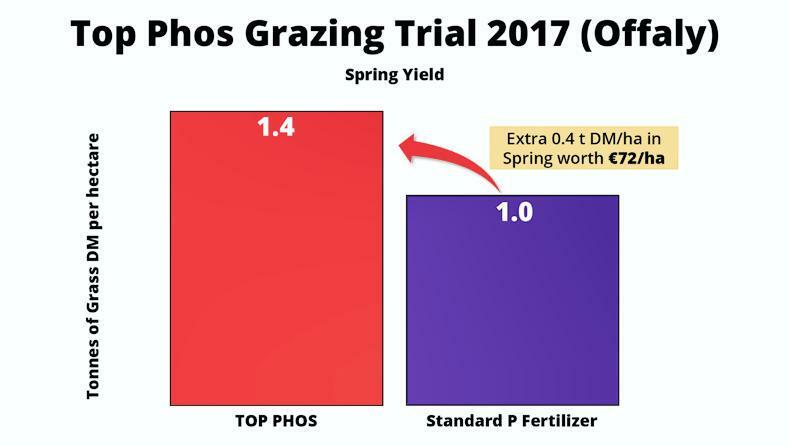 On-farm Irish trials in 2017/18 evaluating the benefits of TOP-PHOS for spring grass growth showed an extra 0.4 tonnes of grass DM per hectare in the Jan to early April period where TOP-PHOS was used as the source of P compared to standard P fertiliser. This results in a return of €72/ha of spring grass grown by using TOP-PHOS. TOP-PHOS also has the advantage of allowing greater flexibility when designing a spring fertiliser plan as it is a fertiliser containing both phosphorus and sulphur in the same product. A single application of TOP-PHOS in early spring can help to simplify the overall spring fertiliser programme. This is by getting both phosphorus and sulphur out together. Thereby simplifying the remainder of the spring fertiliser rounds to straight nitrogen (e.g. Urea or CAN). This has the advantage of making fertiliser management in spring more simple and straightforward. If you would like more information on TOP-PHOS just phone or email us and we will get back to you! Top-Phos: Fancy some more Information?